Four years after the January 2010 earthquake, 145,000 people still remain homeless in Haiti. A cheap and simple technology to repair earthquake damaged buildings – developed at the University of Sheffield – could help to reduce these delays by quickly making buildings safe and habitable. Recent tests showed that a damaged building repaired using the technique could withstand a major earthquake – similar in scale and proximity to the buildings that collapsed during the Haiti earthquake. The technology involves wrapping metal straps around each floor of the building, which are then tensioned either by hand or using compressed air tools. It is designed for use on reinforced concrete frame buildings – a common construction technique around the world, including countries like Haiti. Unlike other repair methods, it does not require expensive materials or a high level of technical knowledge, making it ideal for use in the developing world. Lead researcher, Professor Kypros Pilakoutas, explains: “The strapping works very much like a weight-lifter’s belt, by keeping everything tightly compressed to reduce tension on the concrete columns of the structure. Concrete works well under compression, but not when pulled under tension and this is why it has to be reinforced for use in construction. When the reinforcement is faulty or damaged, it can be very expensive to repair. The team tested the technique on a full scale, two-storey building, built according to an old European standard which has inadequate reinforcing to withstand earthquakes. This construction is typical of many buildings in the developing world, as well as many Mediterranean buildings built before the 1980s. The building was constructed on a specially designed ‘shaking table’ which can simulate ground movement caused by earthquakes. During the first test, the building was very near collapse following a small earthquake similar in scale to a magnitude 4 on the Richter scale having about 10000 times less energy than the Haiti earthquake. 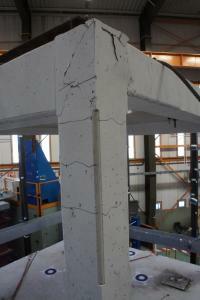 The building was then repaired using the post-tensioned metal straps and retested. The researchers were unable to make the building fail during a major earthquake similar in scale to the magnitude 7 Haiti earthquake at the epicentre and stopped the test at that point. Professor Pilakoutas hopes the new technology will not only speed up the response to major earthquakes, but could also prevent the damage happening in the first place. The cost of the materials for a typical small building column is about £20 and it would take a crew of two people around 2 hours to complete the strengthening. For a typical small dwelling having 6 columns, the seismic rehabilitation would cost around £200 and could be completed in a few days, rather than cost several thousand pounds and take months with other traditional rehabilitation techniques such as jacketing with steel plates or concrete. April 8, 2019 - COLUMN: The Future of our Coastline | Opinion The News GuardDays in the Capitol are punctuated by passionate debates on large issues, and persistent work on local problems. Last week we scored a quiet victory. November 28, 2018 - More seismic improvements slated as Green Elementary project wraps up after delays NRToday.comStudents and faculty at Green Elementary will be safer if an earthquake hits after this week. September 11, 2018 - St. Paul School District's school year looks bright Pamplin Media GroupSt. Paul School DistrictÃ¢â‚¬â„¢s school year looks bright, Local News, Woodburn local News, Breaking News alerts for Woodburn city. November 26, 2018 - The Big One: Preparing for the next powerful earthquake The Daily BarometerCorvallis, Ore. is in the middle of a fault line consisting of two tectonic plates that will cause an earthquake known as 'The Big One'.